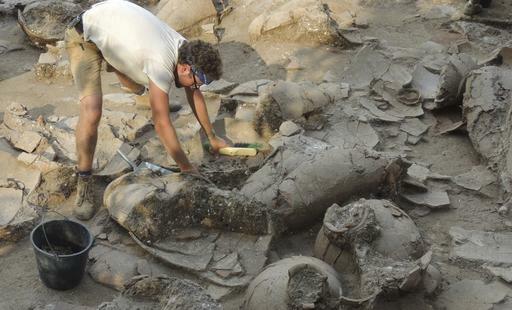 Archeologist dig turns up wine cellar from 1700 B.C. Digging this summer at the ruins of a 1700 B.C. Canaanite palace in northern Israel, archaeologists struck wine. Near the banquet hall where rulers of a Middle Bronze Age city-state and their guests feasted, a team of U.S. and Israeli researchers broke through to a storage room holding the remains of 40 large ceramic jars. The jars’ liquid contents had vanished — but not without a trace. A chemical analysis of residue left in the 3-foot-tall jars detected organic traces of acids that are common components of all wine, as well as ingredients popular in ancient winemaking. These included honey, mint, cinnamon bark, juniper berries and resins used as a preservative. The recipe was similar to medicinal wines used for 2,000 years in ancient Egypt and probably tasted something like retsina or other resinous Greek wines today. So the archaeologists who have been exploring the Canaanite site, known as Tel Kabri, announced yesterday that they had found one of civilization’s oldest and largest wine cellars. The storage room held the equivalent of about 3,000 bottles of red and white wines, they said, and they suspect this was not the palace’s only wine cellar.